Add 2 external or internal SATA 6 Gbps ports to a computer, through a PCI Express slot. 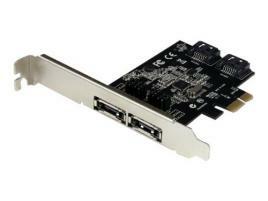 The TPE-PCIESATA PCI Express SATA III Controller Card (6 Gbps) gives you the option to add 2 internal or external SATA ports to your computer, through a single PCI Express (x1) card slot. The card features on board jumper selection, which enables you to configure the card to provide 2 internal or external SATA III ports, or one of each, as needed. The card is fully compliant with the SATA revision 3.0 specification (up to 6Gbps of data bandwidth), enabling you to utilize the speeds of high performance hard drives and Solid State Drives (SSD), as well as SATA-based optical drives (CD-ROM, DVD-ROM, Blu-Ray). In practice all recently released distributions are compatible.